Kitchen Window -- You Say Filberts, I Say Hazelnuts: Any Way, Delicious Depending on where you live, you may know these bronze-shelled little nuts by a number of names. And their uses are just as varied. From the nation's hazelnut capital, Oregon, come recipes for nut-studded salad, pasta and more. Get recipes for Sweet And Spicy Roasted Hazelnuts With Rosemary, Oregon Bounty Salad, Dukkah and Pappardelle With Hazelnut Cream. When I lived back on the East Coast, if you had asked whether I liked hazelnuts, my answer would have been an emphatic "no." Hazelnut coffee and the imported oil for vinaigrettes were fine. However, the whole hazelnuts I occasionally encountered -- say, in a blend of salted, mixed nuts -- often tasted rancid. Nor did most chocolate-and-hazelnut confections, especially Nutella spread and those gold foil-wrapped Ferrero Rocher truffles, appeal to me. They seemed to mask any fresh hazelnut flavor. I love hazelnuts in desserts ... [but] savory hazelnut preparations really shine this time of year. You can work them into any course — appetizers, soups, salads, cheese plates and meat dishes. Hazelnut stuffing with the turkey, anyone? So an epiphany came when I ate my first raw, unadorned Oregon hazelnut. Suddenly, its earthy, sweet flesh made it a favorite nut, second perhaps only to my native Virginia peanuts. Of course, one can't avoid the freshest specimens in Oregon. The Willamette Valley grows a whopping 99-plus percent of the U.S. hazelnut crop. Oregonians spread hazelnut butter onto bread for PB&J, infuse beer and liqueurs with the nuts and mix hazelnut flour, ground locally by outfits as large as Bob's Red Mill, into cookies and cakes. We blend hazelnuts -- instead of pine nuts -- into our pesto. Even our pigs are hazelnut-fed. It's hard to avoid hazelnuts on menus, in grocery stores and at farmers markets here. To avoid the rancid ones, ask to sample the nuts out of the bulk bin (if available) before purchasing. Seek out raw hazelnuts, which store better than their overcooked cousins. Even the roasted local ones I recently sampled at our food co-op tasted off -- almost burned -- to me. 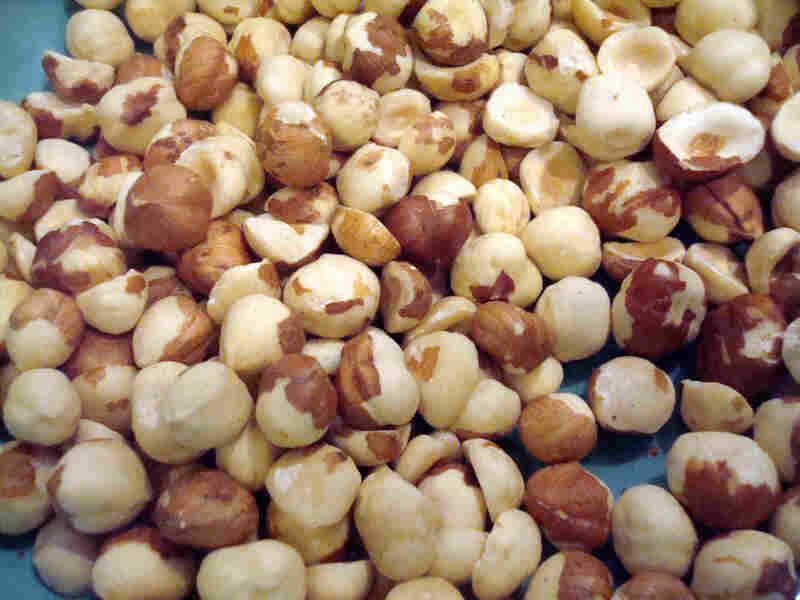 Imported hazelnuts generally come from Turkey, the world's top producer. Look for Oregon hazelnuts at gourmet, specialty grocers. You have to ask for them. The state's more than 600 growers will gladly ship you some. The big orchards, third- and fourth-generation farms, sell the nuts, both plain and in candies, through their websites. Buy them still in their acornlike shells for that holiday nutcracker-by-the-fire ritual. Laura McCandlish is an Oregon-based freelance writer and radio producer. She contributes to The Oregonian's FOODday section, hosts a monthly food show on Portland radio station KBOO and reports for NPR member station KLCC in Eugene. She blogs at baltimoregon.com. Just don't be surprised if some farmers call their crop "filberts." "In Oregon, you grow filberts, but you sell them as hazelnuts," says Anita Azarenko, an Oregon State University horticulture professor with an organic apple and hazelnut orchard. I thought the filberts I fell in love with upon moving here were a species distinct from -- and superior to -- regular hazelnuts. But it's just an old-fashioned name, introduced by French settlers, for the same nuts, which the British, not to complicate things, call cobnuts. The "hazel" comes from the Anglo-Saxon word for cap or hat; the tree's genus name Corylus also invokes the helmetlike shape of the nuts. Oregon growers (and their marketing board) officially started calling their product "hazelnuts" in the 1980s, as demand for exports grew. Befuddled customers had been sending their "filbert" shipments back. Oregon's temperate climate is perfect for hazelnuts. The Barcelona and Ennis varieties, in particular, thrive in the mild, wet winters and dry summers that also allow pinot noir grapes, berries and tree fruit to flourish in Oregon's well-drained soil. The state's orchards are busy planting new varieties resistant to Eastern filbert blight, the East Coast disease that has increasingly made its way west. Though available year-round, Oregon hazelnuts are in peak season now. 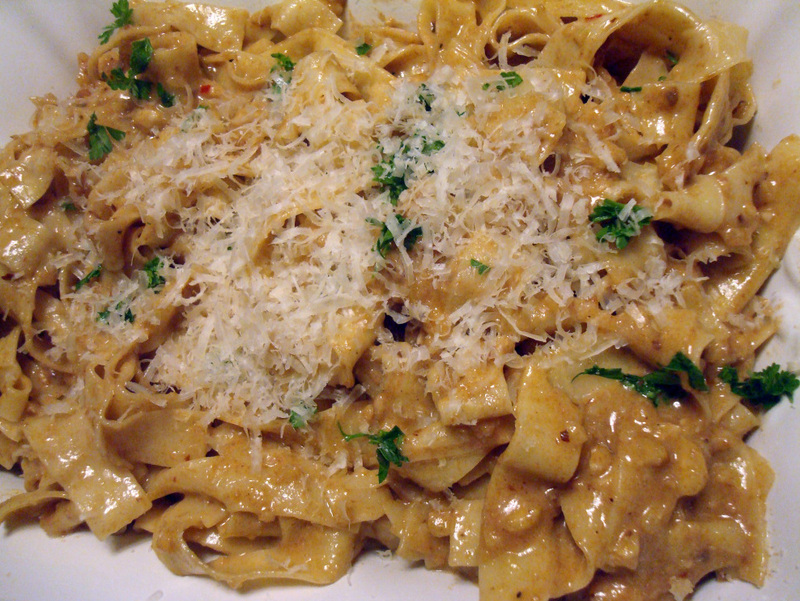 They lend themselves to heavier dishes -- think pappardelle with hazelnut cream -- throughout winter. It's always tempting to eat the nuts raw, straight from the bag. Chefs might disagree, but you can often skip the tedious skinning step, especially if your hazelnuts are small, with thin, hard-to-remove skins. Thicker skins can be more bitter. Now I love hazelnuts in desserts, especially in fruit crisps and tarts, with caramel and whipped up into hazelnut gelato. My tastes just veer away from chocolate. Savory hazelnut preparations, however, really shine this time of year. You can work them into any course -- appetizers, soups, salads, cheese plates and meat dishes. Hazelnut stuffing with the turkey, anyone? For inspiration, and wine and beer pairings, consult author and illustrator Jan Roberts-Dominguez's soon-to-be-released cookbook published by the Oregon Hazelnut Marketing Board. "I now view hazelnuts as a bridge," Roberts-Dominguez says. "The flavor profile is amazingly broad, from smoky and toasty all the way to fruity." I agree. In salads, hazelnuts serve as a mellow bridge between herbaceous greens and spicy, tangy vinaigrettes. Hazelnuts also straddle the seasons, in popular winter salads with crisp apples or pears and salty-sweet blue cheese. As the days darken, simply pair them with persimmons or grapefruit instead. I can hardly name an ingredient they wouldn't complement. Unfortunately, the hazelnut crop is sparse this year. So gather them while you can. Just don't let the nuts go rancid on the shelf. Store your hazelnuts in the freezer, to better enjoy them throughout winter and into spring -- if they last that long. Preheat the oven to 350 degrees. Lay hazelnuts out in a sheet pan in a single layer. Roast the nuts in the oven until they begin to turn golden and smell toasty, about 8 minutes (but up to 15 to 20 minutes for larger nuts). Better to undercook than burn them. 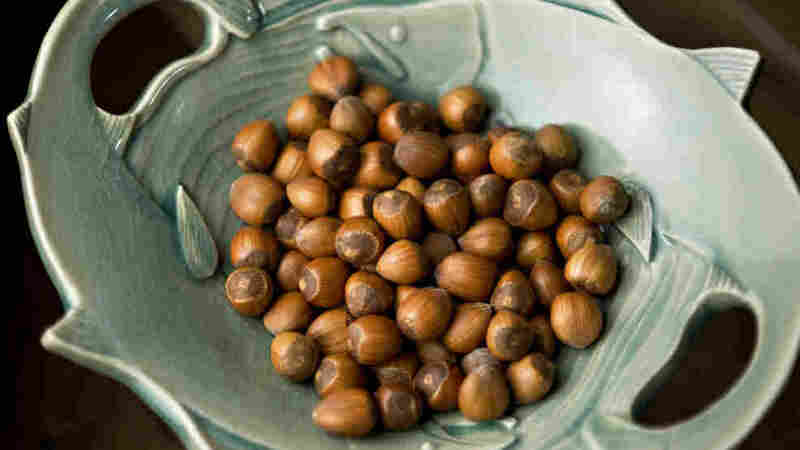 To remove the skins, transfer the still-hot hazelnuts from the oven to a paper bag or dish towel, enclosing it around the nuts so they steam and their skins start to blister away from the kernel. Rub the nuts together in the bag or towel for several minutes. Carefully transfer the cooled nuts to a bowl and discard the papery skins. Don't worry if you can't remove all the husks. Roberts-Dominguez says she gets better results by placing the roasted, cooled nuts in a large plastic bin with a firm-fitting lid. If there are 4 or 5 inches of nuts, then make sure there's about 10 inches of head space above them. Then just shake the bin like crazy for about 60 seconds. The skins shed really well as the nuts crash into each other. Then go outside, pour them out onto a large try and blow away the papery skin. No mess to clean up inside! 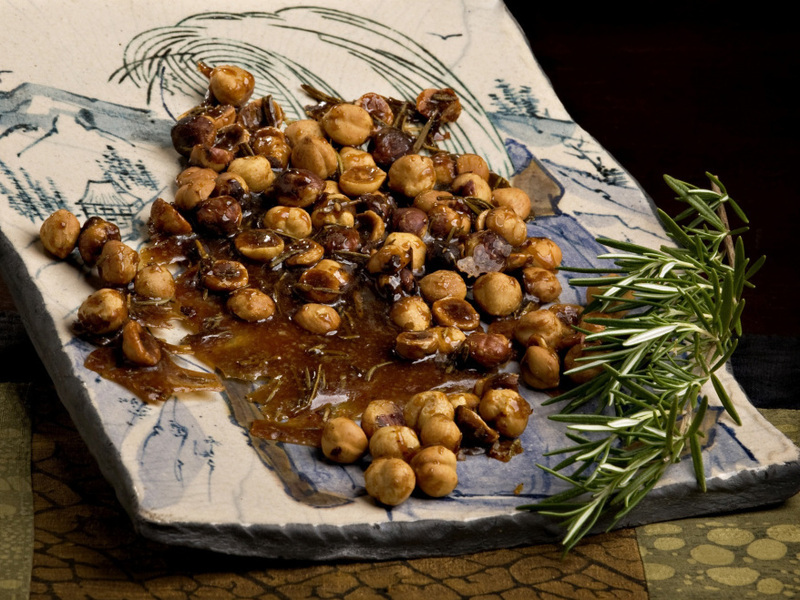 With piney rosemary and a kick of cayenne, these caramelized nuts are a perfect nibble for the holidays. It's one of the starring recipes in Jan Roberts-Dominguez's new cookbook, Oregon Hazelnut Country -- The Food, the Drink, the Spirit (Hazelnut Marketing Board 2010). She pairs the cocktail nuts with fruity Zinfandels, amber ales and hoppy IPA microbrews. Preheat oven to 350 degrees. Place the butter and corn syrup in the center of a rimmed baking sheet and warm in the oven until the butter has melted. Meanwhile, in a medium-size bowl, combine the hazelnuts, brown sugar, rosemary, salt and cayenne. Transfer the mixture to the baking pan, stirring the mixture again with a flat-sided spatula to incorporate the butter and syrup. Bake until the sugar melts and caramelizes around the nuts, stirring every 5 minutes with a wide spatula or a pastry scraper, for about 20 minutes total baking time. While the nuts are roasting, spread a large sheet of waxed or parchment paper on a cutting board. When the nuts and coating have darkened, remove the pan from the oven and immediately scrape them out onto the paper, quickly spreading the nuts out so they don't touch each other for the most part. Allow them to cool and then break them apart as desired into single nuts or clusters. The pieces should be stored at room temperature in an airtight container, in which they can be kept for several weeks. This salad showcases the state's culinary gems: Willamette Valley hazelnuts, Hood River pears and Rogue Creamery's famous blue cheeses. It's a classic salad combination, dressed with a warm bacon-maple vinaigrette. This recipe is adapted from chef Intaba Liff-Anderson of Fireworks Restaurant in Corvallis. Mix everything together in a blender, including the bacon, and process until nearly smooth. It's fine if some nubs of bacon remain. Extra dressing stores in the refrigerator. Just be sure to warm it before serving. Mix ingredients together well. Pour onto greased sheet pan and bake at 350 degrees until toasted, about 12 minutes, until liquid becomes sticky and starts coating nuts. Upon removing, stir nuts to fully coat. Coating will harden when nuts cool. Chop nuts coarsely when they do. Toss the greens with desired amount of the warm bacon-maple vinaigrette in a large bowl. 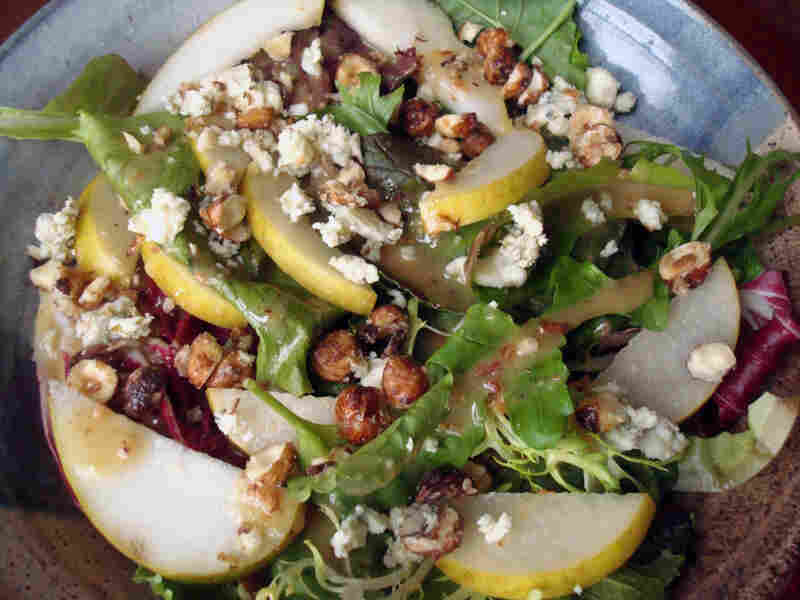 Evenly arrange pear slices over the greens and then sprinkle with cheese and the candied hazelnuts before serving. This Middle Eastern crushed nuts and spice mixture is quite versatile. Try dipping bread or cut vegetables into olive oil and then the dukkah on an appetizer plate. Sprinkle it on salads, meats or on top of flatbread before baking. Slip it under the skin of a chicken before roasting. This recipe comes from Nuts in the Kitchen (William Morrow 2010) by Susan Herrmann Loomis, who adapted it from the Oregon Dukkah company. Dukkah can be sprinkled on flatbread before baking, or dipped into with bread or vegetables, among other uses. Preheat the oven to 350 degrees. Place the sesame seeds in a pan and roast until they begin to smell toasty, about 8 minutes. Check them often, as they have a tendency to toast very suddenly. Remove from the oven and cool. Place coriander seeds in a small skillet over medium heat and saute just until they begin to smell fragrant, about 1 minute. Remove from the heat. Repeat with the cumin seeds. 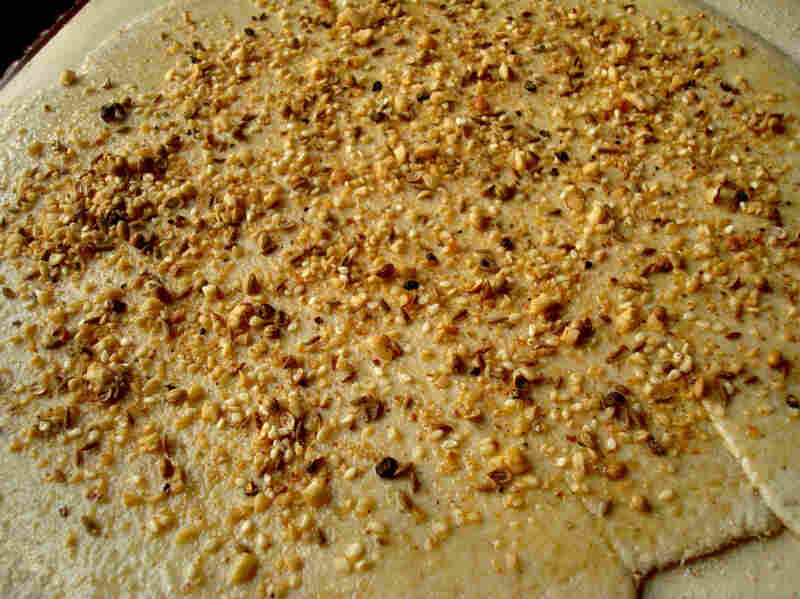 Place the hazelnuts, sesame seeds and salt in a food processor and pulse until the nuts are coarsely chopped. Add the coriander and cumin seeds, pepper and paprika and process until the mixture is finely ground. Be careful not to overprocess so the nuts don't become oily. Taste for seasoning -- you may want to add more salt. Transfer to a serving bowl and serve immediately or store in an airtight container in a cool, dark spot for up to 2 weeks, or indefinitely in the freezer. A sauce this decadent -- a creamy pesto with a whisper of nutmeg -- demands fresh pasta. It's probably only worth making your own if you have a pasta machine. But refrigerated ones sold at grocery stores and fresh pastas increasingly sold at farmers markets are good substitutes. This hearty recipe comes from chef Jenn Louis of Lincoln Restaurant in Northeast Portland. Combine toasted hazelnuts and garlic in food processor, or chop fine. Add cream, Marsala, grated Parmigiano-Reggiano, olive oil, cocoa, chili flakes and nutmeg. Process until combined and the texture is rough. Season to taste with salt and pepper. Cook pasta in salted boiling water until just al dente. Put sauce in pan, gently melt butter into sauce and add noodles. Gently cook over medium heat and finish cooking as noodles absorb sauce. Serve with grated Parmigiano-Reggiano. Place flour in mixer fitted with a dough hook and add 3/4 of the egg yolks. Mix on medium speed for 10 minutes, gradually adding remaining egg yolks as needed to attain desired texture. Dough should roughly come together. There should be no powdery flour, but the dough should not fully come together like bread dough. It should be moist and in clumps, roughly resembling a brain. Dough should be moist and soft, but not cohesive. Wrap dough in plastic wrap and leave on counter to hydrate for 1 hour. Roll out the dough using a pasta machine. At finish, dough should go twice through the second to thinnest setting. Lightly flour dough between settings. This will help keep the dough from cracking. At the finished product, you should be able to see your fingers through the bottom of the dough. Cut dough into sheets and dust the top of each sheet with semolina. Loosely roll each sheet into a cylinder. Using a sharp knife, cut into 1 1/2-inch-wide slices. Unwrap the noodles; dust with semolina and gently toss to separate. Place on a sheet pan and cover with a tea towel until ready to cook.